We are the betrayed. 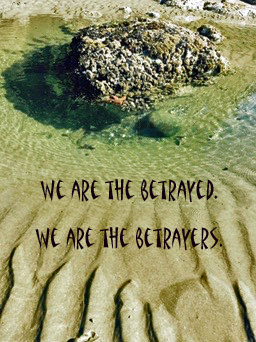 We are the betrayers. The dream is not pleasant. It is filled with violence and I am the victim. And I am the perpetrator. I am semi-awake when I realize what is happening. I don’t want to go back to sleep. The dream is so disturbing. And then I remember. I have the power to change the course of what is happening in my life, even in my dreams. I have the power to awaken myself. And so, I take action. I can think of only one way to stop the perpetrator of the abuse, who is me. It is violent but it is necessary. I kill her. I can think of only one way to help the one who was being abused, who is also me. I turn gently to her, wrap her wounds, hold her in my arms and remind her that she is loved. Always. I awaken fully and feel the tendrils of the dream weaving in and out of my conscious thinking. And I remember a recent conversation with a group of women. We were talking about the meaning of grace and one woman shared about an incident with her beloved that broke her heart. I remember hearing her speak of how broken hearted she was and the thought immediately entered my mind. Beneath the broken-heartedness for me, is a sense of betrayal, I shared with my friend with the broken heart. A feeling that what I trusted, who I trusted, how I trusted has been betrayed. That what I believed to be true, is not true if we can do these things to one another. Everyday. We betray ourselves, our essence, the magnificence of who we were born to be. We betray ourselves through our actions, words. Through doing things that undermine our beauty and spirit. That strip away our dignity and our humanity. I am the betrayed. I am the betrayer. And there I was, a couple of mornings later, killing off the part of me that was mutilating another part of me. Why was that the only way I could think of to stop her violence? The dream continues to resonate. It is for me a metaphor of so much that is happening in our world. We beat one another with our words of hatred. We kill each other with our weapons of destruction. And in each word flung at one another like knives into the heart of our humanity, with each act of violence, we betray the magnificence, the beauty, the purity of our human essence. We do it to others. We do it to ourselves. We use food, drugs, alcohol, anger, indifference, abuse, everything we can think of to avoid facing the miracle of who we are, the beauty of our spirits, and the world around us. We are the vessels of our own betrayal. We are the creators and the destroyers of the birthright of our magnificence we betray every day. My dream was a call to action. A rallying cry for me to wake up and not participate in the betrayal of the beauty of my human being, of all humanity around me. To not let indifference, or silent consent, or criticising, condemning or complaining about anyone or anything be part of my contribution to my world. I will only contribute my best. I killed the perpetrator within me who was killing off the good in me. It was necessary. It was time. There was no other way for me to awaken. yes, they are on a page – but you are shouting them; such harsh contradiction to your recent languid tones from the edge of the beach at the edge of the country. Cathartic? Or two-sided coin? Does figuring it all out matter, or is shouting it out transforming in itself? I’d have to say it’s the latter Mark — and always two sided coin. Wow. Good Metaphor!! JUST like a bad dream – we have the control to not go back to sleep. Sometimes we don’t take that SAME control in our own lives! I think that’s why I decided to write it out Di. I wanted to release myself from betrayals of all kinds. Hugs my friend. Women are our own worst enemies – it’s shown in many ways. Always apologizing, etc. Great post. Wow! Magnificent post with all that subtle underlying truth in your dream (nightmare). I am glad that you killed off the inner part of you that was betraying the rest of you. What is your formula? RAdical forgiveness author, Collin Tipping, has a process whereby you bury your ‘bratty inner child’. The one who likes to stomp her feet and create all sorts of drama. I have worked on doing this for a long time — and continue the world. It’s interesting — Val’s comment below was my first reaction — how can I ‘kill’ a part of me. When I have a loving and honouring ceremony to bury that part of me that has created so much angst in my life, I let go of what was holding me back from loving that part of me…. IN fact — this will be the subject of my blog today. 🙂 Thanks Elizabeth! Food for thought, including the comments!